The Cam started life as springs in the Mendip Hills draining in an easterly direction through Camerton, and Combe Hay, joining the Wellow Brook at Midford, becoming the Midford Brook, and finally flowing into the Bristol Avon. Dominated by the limestone of the Mendips, a combination of clay soils and steep periglacial valleys cause the brook to be a relatively reactive spate river. Good for Trout, Eel and Stickleback. Home to Kingfisher, Sand Marten, Grey Wagtail. And Dipper. I used to play in a small tributary of the Cam rising near the village of High Littleton - only a stones throw from home in Timsbury. And it was here in Greyfields that I saw my first Dipper, feeding young at a nest under a mossy bank. I came back to the brook, like a long lost friend, in my late teens and spent much time revising for my ‘A’ Levels’ along its banks near Midford. Though I think I spent more time watching Dipper than revising! Sitting quietly I would watch them for hours near a favoured weir and on one memorable occasion - in late Spring - I watched them feeding underwater in a clear pool. My study all the richer having read Richard Jefferies’ account of Dipper on Exmoor. When he visited Exmoor in the summer of 1882, Jefferies soon fell in love with the sweeping expanses of heather moors and the rocky, bubbling streams which supported a variety of wildlife. 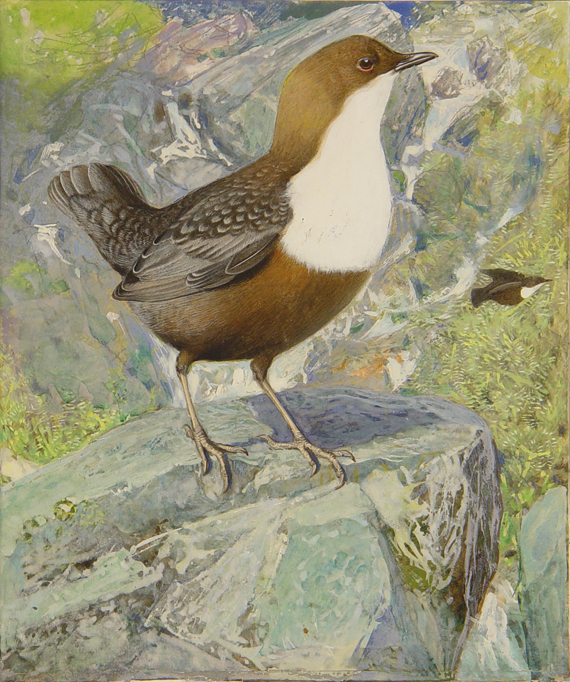 This short piece is a close-up study of the water-colley, more commonly known as the dipper. The sweet grass was wet with dew as I walked through a meadow in Somerset to the river. The cuckoo sang. ... Walking through the grass, and thinking of the dew and the beautiful morning sunshine, I scarcely noticed the meadow was coloured, or rather tinted, with an abundance of the orchis [early purple], palest of pale pink, dotted with red, the small narrow leaves sometimes with black spots. They grew in the pasture everywhere, from the river’s side in the deep valley to the top of the hill by the wood.... I came on the Colley [Dipper] suddenly the first time, at a bend of the river; he was beneath the bank towards me, and flew out from under my feet, so that I did not see him till he was on the wing. Away he flew with a call like a young bird just tumbled out of its nest, following the curves of the stream. ... Presently I saw him through an alder bush which hid me; he was perched on a root of alder under the opposite bank. Worn away by the stream the dissolved earth had left the roots exposed, the Colley [Dipper] was on one of them; in a moment he stepped on to the shore under the hollow, and was hidden behind the roots under a moss-grown stole. When he came out he saw me, and stopped feeding. He bobbed himself up and down as he perched on the root in the oddest manner, bending his legs so that his body almost touched his perch, and rising again quickly, this repeated in quick succession as if curtsying. This motion with him is a sign of uncertainty—it shows suspicion; after he had bobbed to me ten times, off he went. I found him next on a stone in the middle of the river; it stood up above the surface of a rapid connecting two pools. Like the trout, the colley always feeds at the rapids, and flies as they swim, from fall to fall. He was bobbing up and down, his legs bent, and his rusty brown body went up and down, but as I was hidden by a hedge he gained confidence, suspended his curtsying, and began to feed. First he looked all round the stone, and then stepped to another similar island in the midst of the rushing water, pushing his head over the edge into it. Next he stepped into the current, which, though shallow, looked strong enough to sweep him away. The water checked against him rose to the white mark on his breast. He waded up the rapid, every now and then thrusting his head completely under the water; sometimes he was up to his neck, sometimes not so deep; now and then getting on a stone, searching right and left as he climbed the cascade. The eddying water shot by his slender legs, but he moved against it easily, and soon ascended the waterfall. At the summit a second colley flew past, and he rose and accompanied his friend, swept round the meadow, and so to the river behind me. On reaching the river at a safe distance down, they skimmed along the surface like a kingfisher. ... ‘Peep Peep’ - a black and white bird rounds a bend in the river and alights, bobbing and winking, on a rock midstream, opposite to where I was lying ... a Water Ousel or Dipper. But the best time to watch Dipper is in Winter. On a cold winter's day when few birds are singing, the bright rambling rippling song of a dipper by a rushing stream is always a surprise - the song of the river embodied - somewhat similar to the Whitethroat – with lots of buzzes and churring interspersed with the up and down cadence of their thin warbling. ... The dipper or water-ousel is the most certain January singer, for even the hardest weather does not silence him. When the woods are hushed and white with snow, and the burn is pinched by frost, so that only a narrow dark channel of running water shows between the ice and snow at the side of it, there on some stone in the burn the dipper will stand and sing. It is water rippling over a stony bed that he frequents; the soft luxuriance of a chalk stream has no attraction for him. His song seems part of the sound of the rippling water, from which he is never away. “I hear thee where the waters run” may well be said of the dipper. His song is very sweet and lively; it has no marked beginning or close, but goes on indefinitely. It is as if ” beauty born of murmuring sound” had passed into the bird who was giving it back as song to the stream whence it had come. ... 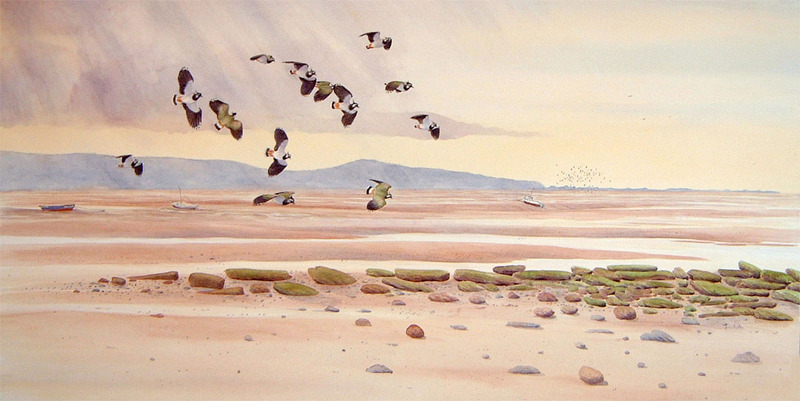 It was another moment when the song of a single bird penetrates to the affections and abides thereafter in the memory.